Singer-songwriter Tom Odell has become the first male artist to win the Brit Awards' critics' choice prize. The 22-year-old, from West Sussex, follows in the footsteps of Adele, Emeli Sande and Jessie J - who were all tipped for success by Brits' voters. Odell, who released his debut EP Songs From Another Love earlier this year, also features on the BBC Sound of 2013 longlist. A "thrilled" Odell, said: "I genuinely can't believe it." "Looking at the list of amazing female artists who have won the award already, I just hope I don't let the boys down." Odell beat futuristic R&B group AlunaGeorge and soul singer Laura Mvula to take the prize, which he will receive at the Brit Awards next February. Born in Chichester, he studied at the Brighton Institute of Modern Music, and has been compared to the late Jeff Buckley and Chris Martin of Coldplay. His low-key, piano-led music has won numerous fans, including Lily Allen, who originally signed him to her record label, In The Name Of, earlier this year. "His voice if fragile yet powerful and he sings mainly love songs," she told the NME earlier this year. "I'm not usually a massive fan of singer-songwriter stuff, but when I saw him live, his energy onstage reminded me of David Bowie. It's not soppy and moany at all, it's energetic and insightful. And he's totally gorgeous as well!" 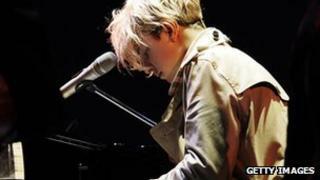 Media captionTom Odell: "I never really decided to write"
Odell recently supported Jake Bugg on his UK tour and is performing with BBC Sound Of 2012 winner Michael Kiwanuka this month. The Brit Awards ceremony takes place on 20 February at London's 02 Arena. James Corden, who had to cut off Adele's acceptance speech last year as time for the live broadcast ran out, will return to host the event. Adele is expected to win a new award, which is aimed at recognising the impact of UK artists overseas, at the ceremony. However, Mumford and Sons and One Direction could also be in the frame for the prize, after a successful year in the US. Meanwhile, the top five acts on the BBC Sound of 2013 shortlist will be unveiled in reverse order from 31 December to 4 January.